MagPress.com are developed and maintained by 3 brother from Asia. MagPress.com started out as a Free WordPress Theme download site back in 2005 and now becoming one of the largest Free WordPress Themes Directory with over 1 millions downloads world wide. MagPress visited by users from United State, India, Indonesia, United Kingdom and Russia according to Alexa history stats. We had help more than 100,000 webmaster and blogger started a beautiful and easy to use WordPress Template for their new sites. Today, MagPress not only provide Simple Free Themes for WordPress CMS Platform but also provide Free Responsive and Clean Modern HTML5 WordPress Themes for users to use without any knowledge of HTML and CSS. MagPress also provide an opportunity for any users to purchase a developer version of any of our themes to remove our credit links and received 100% free yet premium support via our support forums or by priority emails. Developers at MagPress are constant follower of recent trend in designs and web coding standard so users using our free themes can have the most standard and up to date HTML CSS Markup to use in their website. To date we have more than 30+ mobile friendly WordPress Themes that work perfectly in mobile device such as iphone, ipad or any android phones. With the demanding request on mobile friendly WordPress Theme, we always release a ‘responsive’ theme so any users using our themes will not loss their viewers in mobile space which may or may not cover 30% of average device usage visit. MagPress always welcome new members and visitors from around the globe so we can help them start their own site without worrying about site designs or new theme development. 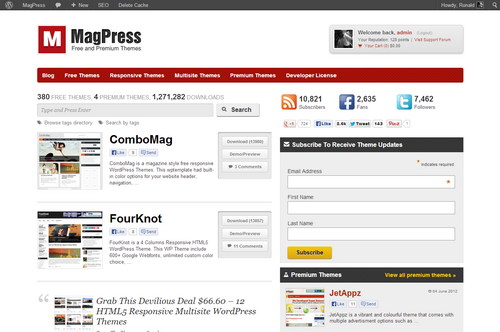 A simple install of our WordPress Theme can easily be customize via theme options if the theme support this functions.